The Milwaukee Rowing Club was founded in 1894. For nearly 100 years members rowed on the Milwaukee River above the North Avenue dam which, until the 1930's, was the city's principal recreational area with swimming beaches, swimming schools, and canoeing and rowing clubs. The Club is not Milwaukee's first or only rowing club. 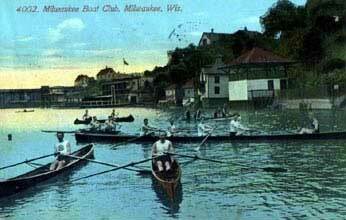 In the late 19th Century there was an earlier club called the Milwaukee Boat Club as well as other rowing clubs. Until it burned in 1961, the Club boathouse was located at the east end of the North Avenue dam. The Club then moved to the former Downer College boathouse in Hubbard Park until that burned in 1989. After that fire, the Club moved below the dam to its present location at 1990 North Commerce Street, less than a mile from its original site. Construction of the new boathouse was completed in 2003 as part of the Beerline River Homes and River Court development. I have very fond memories of the Milwaukee Rowing Club. My grandfather Walter Rahn and father Wilmar "Bill" Rahn were both members of the club. 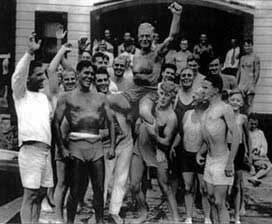 In the mid to late forties I learned how to swim, with the help of my grandfather and member encouragement, off the dock in the Milwaukee River at the old boathouse just above the dam. I also later learned to row. My swimming lessons with my grandpa are a cherished memory. He had a 3-4" wide canvas belt with steel rings at each end. The rings were attached to a rope that was supported by him and the belt went around my waist so he could keep me afloat as I learned. He would walk the length of the dock out one side and back the other all the time giving oral instruction. He and my father were good swimmers and I became one and finally was able to join them on their regular swims across the river and back. I remember the famed "sundeck" at the old club and you can imagine my surprise, I was only 6 or 7, when introduced to the "au naturale" format then used. I don't suppose that's a current practice. Anyway, recently I was going through some old photos my father had taken and saved and came upon the attached. It was taken in 1950 and if the caption does not appear on this attachment the pictured are from left to right Walter Rahn (my grandfather), August Grabe, and Ed Aldridge. I hope you enjoy.